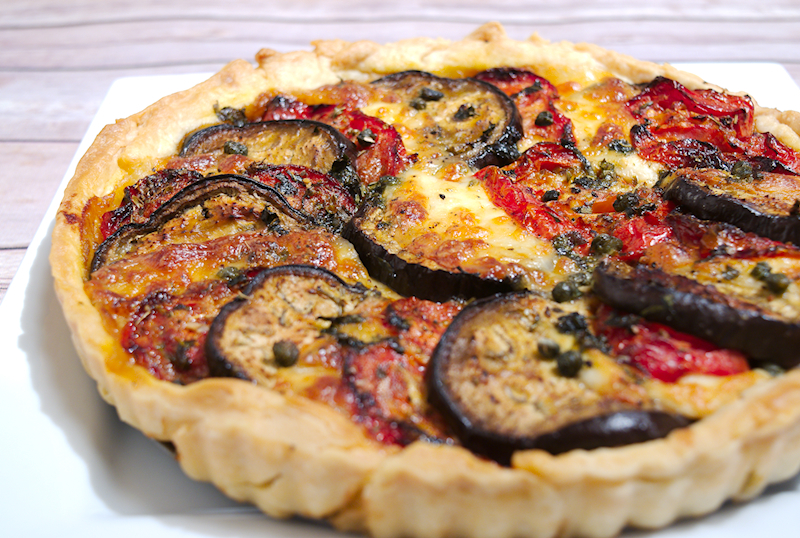 A summer recipe for delicious roasted eggplant and tomato tart. Together with the basil mozzarella it’s almost an Italian Caprese bake. Summer is here and her majesty, the eggplant comes again to stimulate our senses and palate. 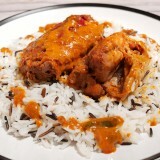 This is a recipe with Mediterranean origin (of course!) that blends roasted vegetables with herbs and mozzarella cheese. There a few crucial points that need attention in this recipe. First, the pastry itself. I strongly recommend to make your own pastry and not using much butter (not at all, if possible). I have to admit that I have been a lazy boy and bought some ready-made from the supermarket. While it works fine, I found it overwhelming with butter. Next time (I promise) I will make my own. You can look around for some good recipes for homemade pastry for savory tarts. The second one is the tomatoes. They have to be ripe, juicy and sweet. Spend a couple of extra bucks and get these nice, but maybe more expensive, ones. You will be rewarded. Always use extra-virgin olive oil. It makes a difference and is much healthier. Get these nice and fresh mozzarella balls and not the dried shredded one. 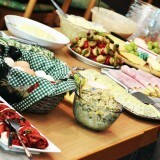 If possible, and you can afford it, get the mozzarella di Bufala for extra pleasure and gastronomic sensations. 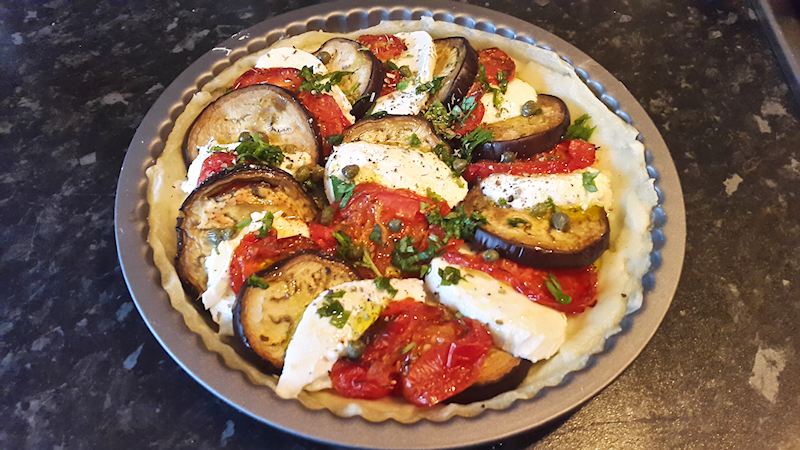 Roasted eggplant and tomato tart is relatively easy and a great idea for light lunch or dinner. 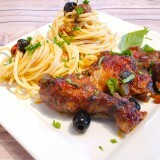 Try it for some unique Italian and Mediterranean sensations. 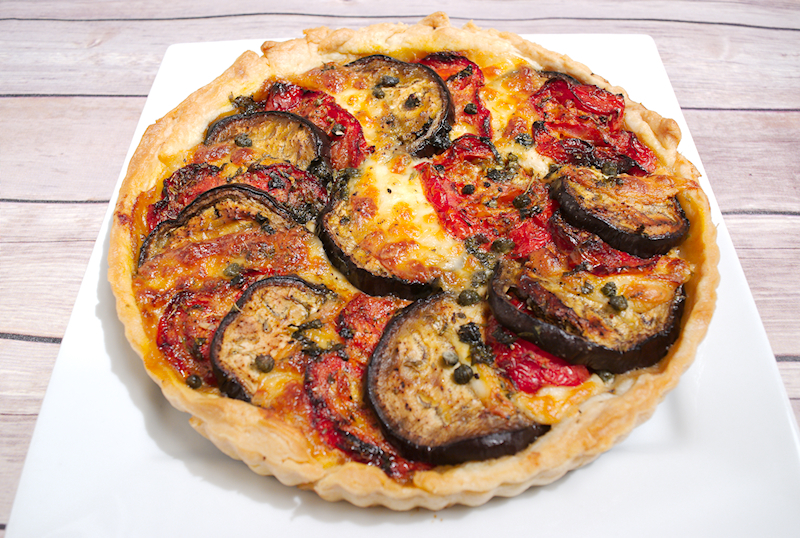 A summer recipe for delicious roasted eggplant and tomato tart. Together with the basil mozzarella it's almost an Italian Caprese bake. 5-6 medium sweet and juicy tomatoes sliced. 200 gr (7 oz) fresh mozzarella (di Bufala if possible). A small bunch of fresh basil finely chopped. ~ ½ cup of extra virgin olive oil. Cut the eggplants and tomatoes into ~1/2 inch thick slices. 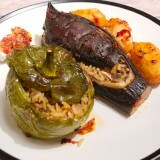 Cover a flat tray with parchment and put the eggplants on top. Brush them with olive oil and sprinkle some salt. 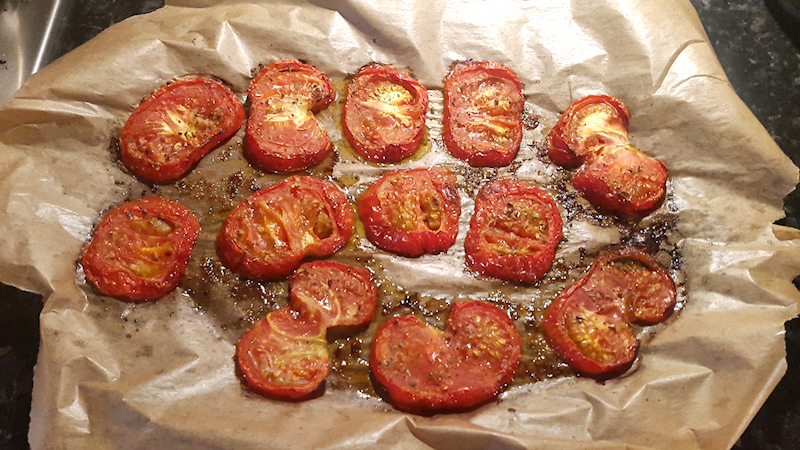 Cover another tray with parchment and lay the tomato slices. Sprinkle some olive oil on top, oregano, salt and pepper. Roast the eggplants and tomatoes until they start getting brown (the tomatoes may need a bit more time). Use a medium round tray for tarts a brush the bottom and walls with olive oil. Place the shortcrust pastry sheet and make sure it covers the bottom and walls. Cut the remaining pastry. Slice the mozzarella in about ½ inch tick slices. 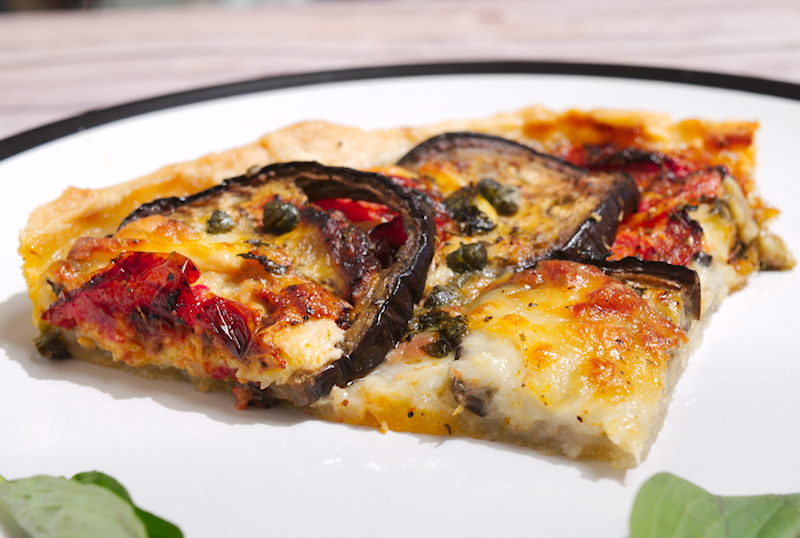 Start filling your tart by placing 1 eggplant slice, one tomato slice and a slice of mozzarella. Repeat until you cover the whole tray. While doing that, throw some of the basil. Add the rest of the basil on top and scatter some capers. Season with salt and pepper. Bake in the oven for ~ 30 minutes until the cheese starts getting a nice brown color.